The Shop Fox W1713 is a variable speed scroll saw of the 16 inch variety. Its main specs of note are its cast iron construction, its extra cutting capacity, and its variable speed control that allows for cutting of varying materials. What’s more, this is a sought-after scroll saw that offers a dust port, dust blower, a gooseneck work light, and a 45-degree tilt table that allows for angular cuts and straight cuts. The blade changes for the Shop Fox W1713 16-Inch Variable Speed Scroll Saw are quite easy and safe to do as well. As for its dust control setup, it does two-way dust control in that all the dust goes to the dust port but doesn’t come out towards your face or the work piece you’re attempting to cut. 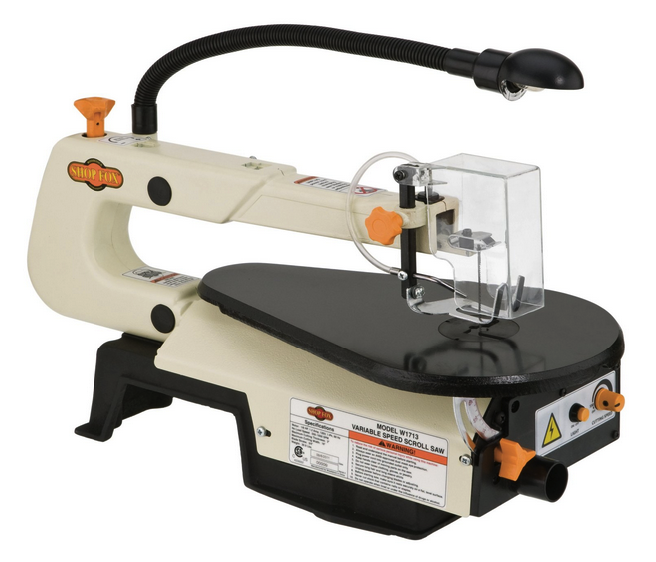 The Shop Fox W1713 16-Inch Variable Speed Scroll Saw also has extra cutting capacity. What that means is that the unit outdoes many other 16-inch scroll saws in its class by being able to cut more than they could. It’s better than the average scroll saw, in other words. Meanwhile, it’s compatible with plain and pin-end blades as well. Whatever the blade type, it can accept (which further helps out with its supposed ability to cut thicker and tougher material with its extra strength cutting power; you really can cut through anything as long as you have various blades at your disposal). Blade changes need not be complicated or downright dangerous since you have near universal compatibility with common blade types, the pin-end or plain saw blades (plus included adapters). Instead of cutting work pieces at different angles and miter cuts from zero degrees to forty-five degrees with the saw arm tilting to make the cut possible, the Shop Fox W1713 16-Inch Variable Speed Scroll Saw instead cuts by tilting the table through a special mechanism then doing the cut, with the work piece tilting along with the table surface. There’s a table lock knob and tilt scale included so you know the angle and level of the table tilt, plus it’s quite handy for horizontal angle cuts in particular. Meanwhile, the dust port of your scroll saw ensures smooth operation of the unit since it is 1¼ inches in size. Furthermore, the blower gets rid of the dust and debris before they can accumulate into your workplace or work pieces. Motor: The 60 Hz, 110-volt motor of the Shop Fox W1713 has ⅛ of an HP and one amp. Cutting Capacity: The Shop Fox W1713 16-Inch Variable Speed Scroll Saw also has the amazing cutting capacity of 16 inches as its maximum cutting width. Accessories: The whole kit includes a dust port, dust blower, and a gooseneck work light so that you can really pinpoint by the last inch or millimeter how accurate your work is. Blade Change Versatility: Whether you have pin blades or plain blades, the unit has adaptors for both. No Load Speed: It can go from 550 to 1,770 strokes per minute (SPM) or rotations per minute (RPM). This is probably one of the cleanest and most work-efficient scroll saws around thanks to its 1¼ dust port that vacuums all the dirt and debris that could obscure your vision on the results of every cut. Thanks to its smoothness of operation, I was able to make by workers work more efficiently with a highly recommended saw that’s a quarter of the price of the leading brands out there. The table insert is completely protected from the wood debris, dirt, and dust that could accumulate underneath the unit. I also love how the scroll saw can use both pin and regular blades thanks to its adaptors. The Shop Fox W1713 Variable Speed Scroll Saw has received 71 reviews and has a 4.2 rating on Amazon.com. The Shop Fox W1713 Scroll Saw isn’t a perfect saw. One of the main selling points of the unit is that it’s versatile and adaptable when it comes to its universal compatibility with various blades. However, there’s more than meets the eye when it comes to the easy and quick blade change claim of the unit. At least one Amazonian user thinks it’s a nightmare to install pin-less blades unto the Shop Fox W1713. It’s not as adaptable as advertised since you only get two metal holders that connect to each blade end, hanging on to two straight hooks. True, blade changes for the Shop Fox W1713 16-Inch Variable Speed Scroll Saw isn’t as easy as advertised on its Amazon.com page or the official website that sells these units. However, it still got a 4.2 rating from 71 reviews because many other users were able to acclimate themselves to blade changing. Just remember to loosen the tension by a lot, unhook the bottom and top blade holders, and then use a small four-millimeter Allen wrench to loosen one of two Allen screws before installing the blades. Tighten the tension of the pin-less saw only after it’s already secured. Aside from that, the Shop Fox W1713 16-Inch Variable Speed Scroll Saw meets expectations as an excellent scroll saw. Read more about other best scroll saw here.